Eczema is a term for describing different types of skin conditions that result in inflammation of the skin. Many people suffer from eczema. Eczema is also known by its more medical term Atopic Dermatitis, which means ‘inflamed skin.’ It is not a contagious condition. It can also be easily triggered by environmental factors like smoke and pollen. This skin condition is quite common for children, but adults can get it too. About 20% of children all over the world suffer from eczema. People with eczema have sensitive skin. And the treatment focuses on healing damaged skin and alleviating symptoms. It is often so difficult trying to find a soap or lotion that doesn’t irritate sensitive skin. This homemade eczema body wash is surprisingly amazing for allergies and skin reactions. I encourage on this blog to embrace all things natural. Yes. 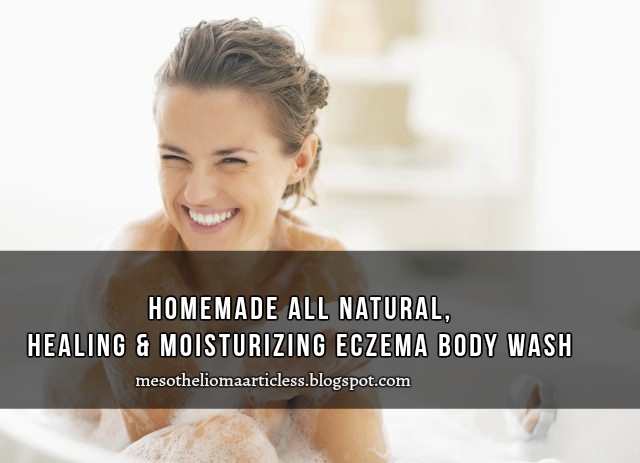 This post will teach you just how easy to make your own homemade natural body wash for eczema. Liquid castile soap – Liquid Castile Soap is a versatile natural soap that can be used in beauty recipes like shampoo and body wash and in cleaning and baby care It is good for sensitive skin types including eczema affected skin. Coconut oil – This oil is wonderfully moisturizing and soothing to eczema. It has antibacterial, anti-fungal, antioxidant and antimicrobial properties that can help soothe your skin when it’s itchy. It can also help reduce the inflammation. Raw honey – Keep the skin moist which helps to reduce or remove the incidence of eczema flare-ups. Vitamin E oil – This vitamin is a strong antioxidant. It also lubricates the skin, speeds up the rate at which cells renew and regenerate. Vitamin E oil is necessary for a soft, smooth and youthful skin. Lavender oil – Using lavender oil for eczema is very common, as lavender oil is a traditional treatment for many skin conditions. Did I mention that it will also give this body wash an incredible uplifting scent? Tea tree oil – Tea tree oil may help relieve itchiness and inflammation associated with eczema. The oil has been proven in medical studies to benefit acne, eczema, psoriasis, warts, fungus and skin cancer. Add the coconut oil to the measuring cup and gently melt it down. You can do this by using the cup to do a double boiler. Once melted, add the black cumin seed oil, raw honey, goat milk, and vitamin E oil. Whisk well until mixed together. Add the liquid castile soap and essential oils and whisk again. Now pour the mixture carefully into your flip top bottle. That’s all! Your Homemade eczema body wash is ready!